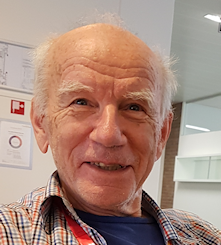 Professor dr. J. H. (John) van der Maas (1936) studied chemistry at Utrecht University and subsequently carried out research in infrared spectroscopy. He became leader of the Infrared and Raman Group in 1962, obtained his doctors degree in 1965 and was appointed full professor of Spectrochemical Analysis in 1980. He was head of the department of Vibrational Spectroscopy until October 2001, when he retired and became Emeritus Professor. Research in the field of infrared was focused on functional group analysis, hydrogen bonding, surface studies, computer supported information acquisition, and the development of new techniques. He is (co-)author of more than 200 scientific papers in peer-reviewed journals, one of the editors of 'Laboratory Methods in Vibrational Spectroscopy' (1987) and author of the book 'Basic Infrared Spectroscopy' (1969). He designed and edited 'The Interpretation of Infrared Spectra', an audio-visual course in 8 lessons. In 1990 he founded Vibrational Spectroscopy (an Elsevier journal).